An original program of the Detroit Regional Infant Mortality Reduction Task Force led by Dr. Kimberlydawn Wisdom, WIN Network was called to order by the chief executive officers of Detroit’s four primary birthing health systems in 2008 (Detroit Medical Center, Henry Ford Health, St. John Providence Health, and Oakwood Healthcare System). Alarmed by persistently high infant mortality rates in the region and gaping health disparities, leaders in the healthy systems committed their organizations to finding lasting, collaborative solutions. The health system partners provide health related education, referrals, and additional and specialty services as needed. Public health departments provide resources, information and data sharing, outreach and pre- and interconception education. Health plans offer provider communications and help explore sustainable payment models and strategic outreach/recruitment. Our academic partners assist with curriculum development and evaluation design, promotion of group education, volunteers, graduate interns, and CEUs where applicable. The community-based, non-profit partners support the work through referral sources, policy advocacy, and access to early head start programs. All collaborating organizations are strategic partners in sustainability planning. Working through an unprecedented public-private partnership of Detroit’s major health systems, public health, academic and community partners, we will tighten a loose net of disconnected medical and social services, thereby building a comprehensive, accountable system of care that will engage the residents of three Detroit neighborhoods to improve the conditions that lead to infant survival through the first year of life. We are becoming a Baby Friendly City. Demonstrate that Community Health Workers collaborating with certified nurse midwives as co-facilitators within the evidence- based Centering Pregnancy® enhanced curriculum for group prenatal care positively impacts the social determinants of health for up to 90 Medicaid eligible, African American women annually who are aged 18+ living in Detroit neighborhoods. 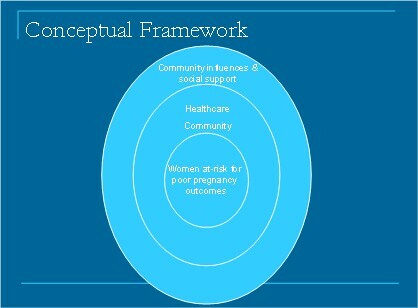 Using high touch and high technology strategies, engage and influence the inter-conception behavior of at least 400 additional women (pregnant, post-partum and non-pregnant) annually by connecting them with WIN Network and alternative resources virtually (website, social media, etc.) and in-person (primary care at HFHS, community-based engagement activities). Using systematic data-sharing and tracking technology, WIN Network will produce metrics that demonstrate patients’ coordinated service use, increased health care savings, lowered health care costs, and improved birth outcome equity (Triple Aim). We will leverage data findings and reports to build evidence base for the impact of CHW engagement around the correlation between the social determinants of health and birth outcomes and to create a replicable model for intervention.